Ronnie O’Sullivan has described the venue for this year’s English Open as “a hellhole” and urged World Snooker to spend more money on tournament hosts. The five-time world champion, 42, won his first-round match at the K2 Leisure Centre in Crawley against Kurt Maflin 4-1 but was unhappy with conditions. “It’s such a bad venue, it demotivates you to want to play. This is about as bad as I’ve ever seen,” he said. World Snooker said other players’ feedback was “overwhelmingly positive”. O’Sullivan is the defending English Open champion, having beaten Kyren Wilson in Barnsley in 2017. But after defeating world number 50 Maflin in just over an hour, he did not hold back on his thoughts on the Sussex venue. “I don’t know what this gaff is but I’ve just done an interview and all I can smell is urine,” he added. “It’s just got no atmosphere in there. I’m practising and I’ve got wires all around the table. There’s no security, you’ve got people running at you left, right and centre. “It’s not the fans’ fault. They [World Snooker] obviously haven’t got the budget to run it properly. 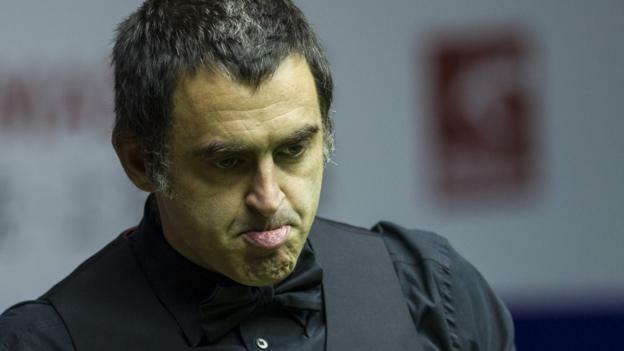 A statement from World Snooker said: “We are surprised to hear these comments from Ronnie given that he has made no formal complaint and the feedback from the other players has been overwhelmingly positive. There were also wins for world champion Mark Williams, who beat Welshman Dominic Dale, 4-1, and world number one Mark Selby eased past Sanderson Lam 4-0, while for world champions Neil Robertson, Peter Ebdon and Shaun Murphy also progressed.